With the many resource files necessary to display many AutoCAD drawings, sending your DWG files to an external consultant can prove to be a challenging endeavor. Of course this was the very reason Autodesk introduced the ETRANSMIT command to AutoCAD many versions ago. Although the ETRANSMIT command isn’t the most complex command in AutoCAD, it does have it’s share of settings for you to specify. 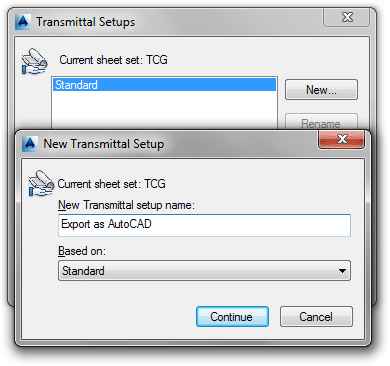 If you use the ETRANSMIT command with any frequency, there’s a good chance you’ve discovered the ability to create what AutoCAD calls a Transmittal Setup. These are a great little tool that will let you recycle your eTransmit settings drawing after drawing, and can be a real time saver if you exchange a lot of drawings. 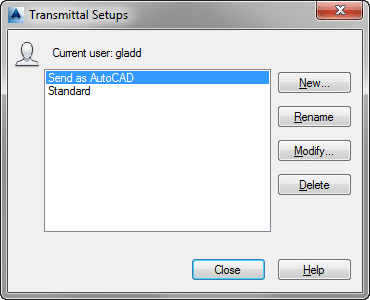 Unfortunately, while AutoCAD provides a way to save Transmittal Settings, the ETRANSMIT command will not let you share them across your company for the purposes of standardization. Open your Sheet Set Manager Template, and select Transmittal Setups by right-clicking on the Sheet Set Name. Click the New button from the Transmittal Settings dialog, and then specify a name for your new transmittal configuration from the New Transmittal Setup dialog. Create your new Transmittal Setup like you would using the ETRANSMIT command. 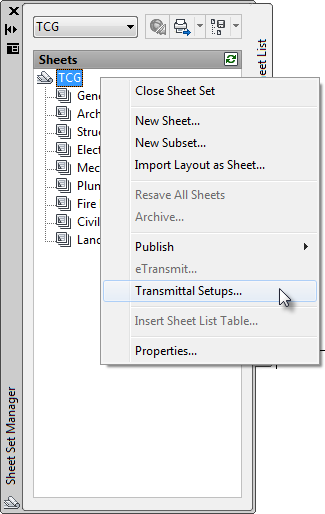 Your new Transmittal Setup is now stored within your Sheet Set Manager template. To use this Transmittal Setup, simply right-click within Sheet Set Manager, and choose eTransmit. 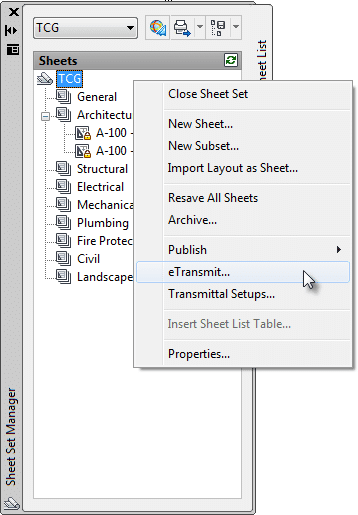 Using the eTransmit command within Sheet Set Manager is very similar to using it outside Sheet Set Manager. 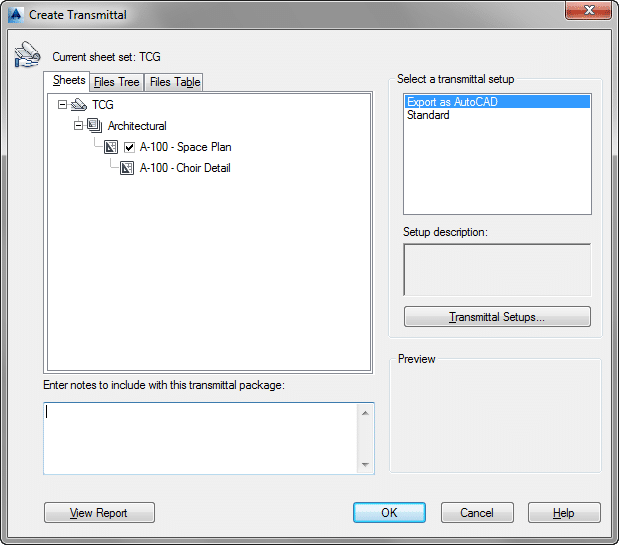 After AutoCAD finished scanning your drawing, the Create Transmittal dialog will open allowing you to specify your new Transmittal Setup.